When it comes to BobCAD’s 3, 4 and 5 axis packages, multiaxis customers get the best we have to offer. Unlocking our highest levels of toolpath with more control and options than any other toolpath features that we offer. Many multi axis users are running 3 axis machines, or machines with a 4th axis. 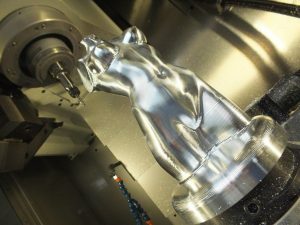 Even more common are 5 axis turion tables like a HAAS UMC 750. Other Mulitaxis users are running Mill Turn machines with C Y and B axis, like a Mazak integrex. Users can be running 3 axis machines to complex Mill Turn applications. Our multi axis package is design for complex 3 , 4 or 5 axis programming. 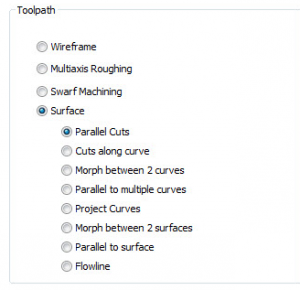 Tool & Die shops that machine complicated surface use the Multiaxis surfacing toolpaths to drive toolpath along surfaces in ways that you just can’t with other toolpath options. Mold Shops that run 3, 4 & 5 axis machines use Multiaxis toolpaths to stub up on tool lengths, program undercuts or parts with negative draft. They also use the 4 and 5 axis tilting options to machine holes locations that are on compound angles eliminating the need for multiple setups among other advantages. Manufacturers that do prototyping find the 3+2 machining allows them to hold parts on dovetail fixtures, giving them access to multiple sides of a part in a single setup. Very popular when machining one off type parts where there is no value in creating complex working holding/ fixtures. Manufacturers and Job shops that run Mill Turn or Multiaxis turning centers find the surface based toolpath extremely valuable when machining cross milled features or feature that require head tilting. 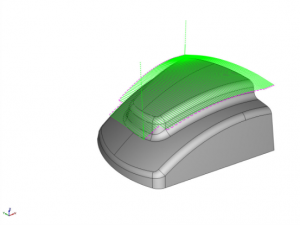 Any shop, manufacturer or programmer that runs complex machines or part geometries benefit from using BobCAD-CAM’s Multiaxis products. 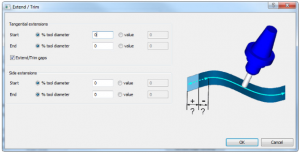 Offering our highest level of functionality for both part programming and simulation. Another huge advantage of multiaxis packages is the built in machine simulation. For all of our other packages machine simulation is an add on product. Having machine simulation built in allows you to use models to represent your machine components and use them with simulation. Typically Multiaxis user’s program the most complex or parts and being able to visually check for gouges with your tools, parts, holders, fixtures and machine components is huge advantage. Without machine simulation many programmers are left guessing, or they spend way too much time making sure the machine will not crash. With machine simulation you can run the part on a virtual machine which is a mirror of your actual machine down to every detail. The result is peace of mind, clearance and gouge feedback, and most of all better programmed parts in less time. When it comes to toolpath you can never have “enough” control. Our multiaxis packages unlock 8 surface based toolpaths that programmers welcome for more complex work. The user input is different that just select the whole model and compute. Surface based toolpath are like a sergeant knife allowing you to create precision cuts on your models just where you need it. At the same time there are time optimizing features that make programming your parts easier. Like using extend and trim. This is just one of feature of our multi axis surface based toolpaths that makes your life easier. Allowing you to extend your toolpath off ends of the drive surface. You can also trim the toolpath back to keep it away from a wall or other feature of your model that you don’t want the toolpath to be driven into. Extend and trim is a quick way to adjust your toolpath without creating additional geometry, our having to use other containment strategies. BobCAD-CAM’s product line is mainly sold as an upgraded product. Which means you purchase the current version and when the next version is released you can elect to upgrade. If you choose not to upgrade at that time, it’s ok there aren’t any penalties. 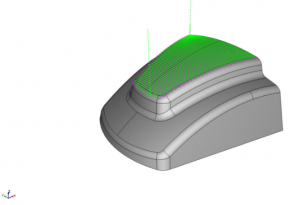 BobCAD’s upgrade program provides a lot of flexibility to users allowing them to choose when to upgrade or not. Our multiaxis package is sold on subscription but there’s a twist. First, you get 12 months of updates and upgrades with your purchase. Which basically means you’ll get 2 version for the price of one. At the end of the 12 months you can elect to renew your subscription , getting you another 12 months up updates and upgrade. What’s different about BobCAD is we also give you the option to get off of subscription without penalty allowing you to upgrade when you choose to.